Luxury real estate property specialist, Ted Kasper demonstrates a philosophy othat the client is always first! There are many qualities and skills that go into being a luxury real estate property specialist - integrity, in-depth community and market knowledge, marketing savvy, effective negotiation skills and a high-quality professional network, all of which are hallmarks of how I work. That said, in my experience as a Austin real estate professional, I've also found that providing the very best service is essentially about putting my clients first. This means keeping myself accessible, being a good listener as well as a good communicator, and responding quickly to your needs. 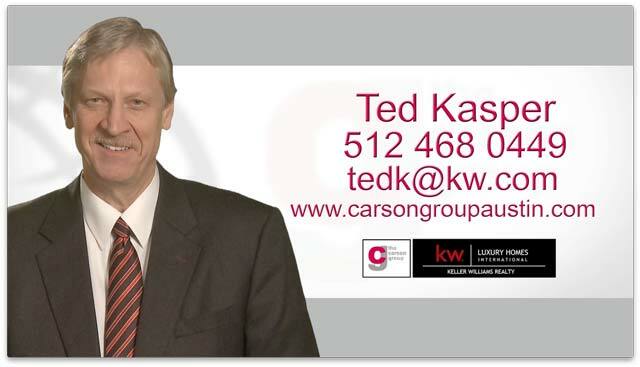 So when you decide that you'd like to buy or sell a home in the Austin areas, please contact me. Austin, Texas…It seems like everyone knows someone who's moving to Austin. The Capital of Texas has grown steadily during the last ten years…Third-fastest-growing large city in the nation. It’s the 14th most populous city in the U.S. Everyone from young urban professionals, and CEOs to students, artists, gamers and musicians are attracted to our town. The change in Austin is noticeable everywhere, from the busy downtown area with its new gleaming skyline, to trendy and pricey neighborhoods. So why is everybody headed here? We’re “The Live Music Capital of the World”, we have over a million bats that live under the Congress Street Bridge, and our unofficial slogan is” Keep Austin Weird”, ‘nuff said? The fact is, rarely does a week go by without the Austin area being listed near the top of a “Best Of” list. Austin is ranked as the third best city to move to in the U.S. We have some of the cleanest air in the country. We have more restaurants per capita than most cities, but we were still named one of the “top ten emerging restaurant markets” in the nation. Another study named Austin as one of the safest cities of its size, and MSNBC included Austin in the “Top Ten Places to Live.” “Austin: the Most Livable City in the Country”- says Kiplinger.